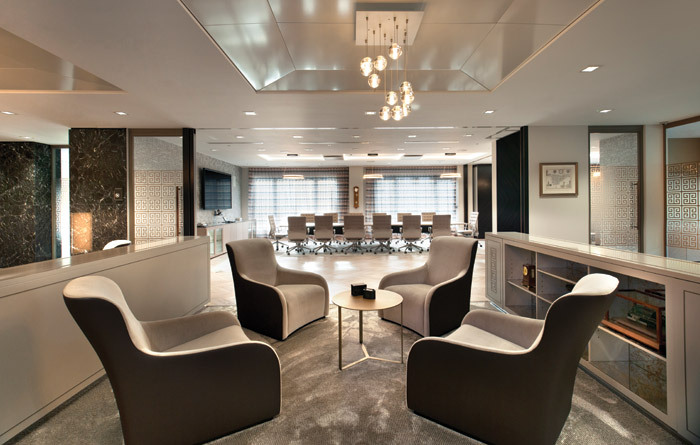 Alpha Bank London sees a move to King William Street, in the heart of the City of London, bringing a new, contemporary workplace for its London HQ as delivered by Resonate Interiors. Moving from what the practice describes as a ‘very traditional environment’, in Cannon Street with several small floor plates, the new HQ is set out over one floor plate while maximising the City views. ‘The design inspiration was to provide this Greek bank with a new headquarters building that represented the ethos of the bank and its heritage, so it was a juxtaposition of new and old,’ explains Pernille Stafford, principal of Resonate Interiors, which was challenged with a doughnut-shaped floor plate to deliver its scheme. ‘Marble and wooden floors set the tone of authenticity and gravitas, but glazed partitions represented transparency and openness,’ she adds. Upon entry, visitors and staff are greeted with a large reception space encompassing appointed seating, mimicking a hotel lobby. A gleaming glass and marble reception desk, flanked by marble panels, provide an air of solidity and elegance. ‘It’s a calm and impressive space for clients and visitors to wait in tranquillity and appreciate the artwork that has been carefully designed into the joinery elements,’ adds Stafford. 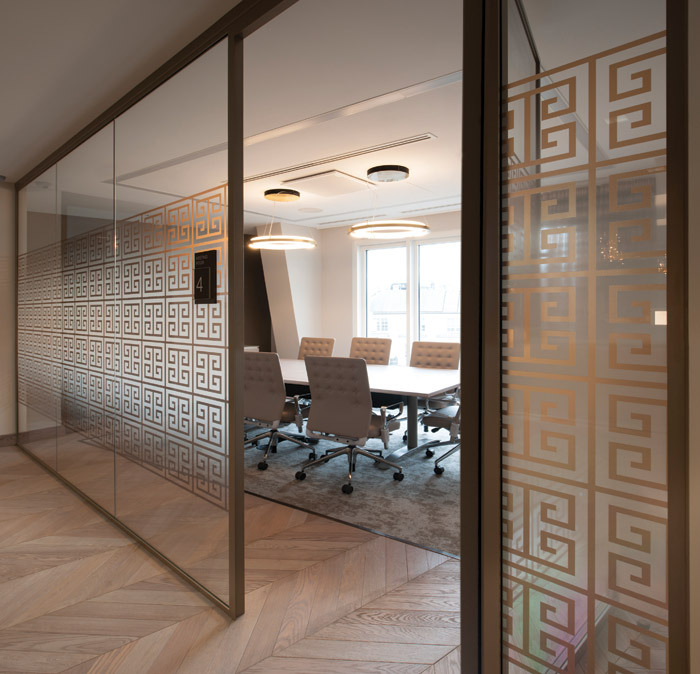 Meeting rooms are designed to surround this space, providing an easy transition from one area to the next, constructed of glazed partitions in bronze framework and a Greek pattern manifestation. ‘The circulation was a challenge as it was a doughnut-shaped building and we wanted to provide connections between departments. 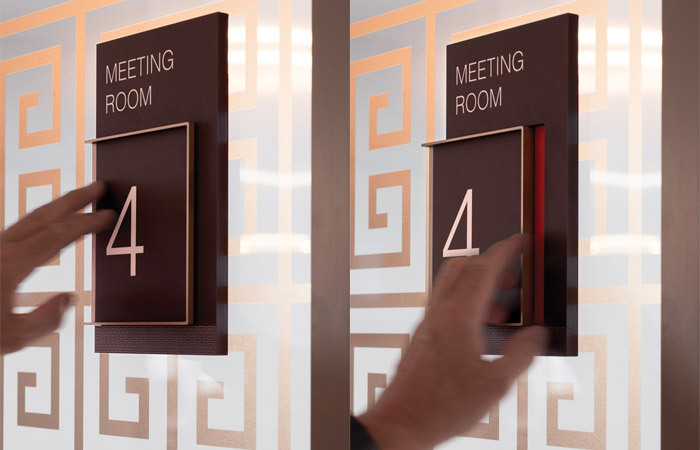 This has been achieved by bringing the breakout area into the middle of the working space, drawing people from both sides of the office,’ says Stafford. The office area is also designed in keeping with front-of-house in a soft and sophisticated palette while contemporary furniture, including from Flokk, Task and Forma 5, set the scene for a professional and well-appointed environment. 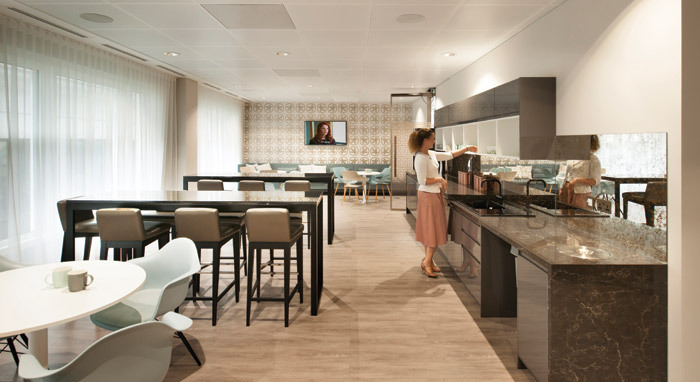 The cafe and breakout area for staff is also a carefully considered space with a marble self-serve counter and a variety of seating options, including from Vitra, Senator and Morgan, to accommodate agile working and lunch-time meetings and gatherings. Overall, the new scheme aims to reflect values, heritage and give confidence to staff and clients alike. It incorporates contemporary working practices, classic materials and clever space planning, which has delighted the client.